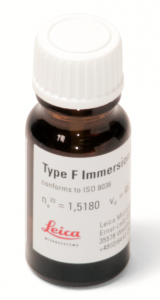 Immersion oil should be cleaned from lens and slide surfaces when observations are complete. Do this for every new slide. 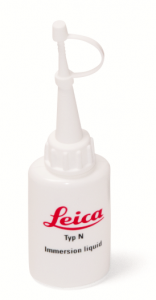 Oil left on lens surfaces will eventually dry and will be very difficult to remove. Carefully wipe oil from all glass surfaces with a folded piece of tissue. With a second tissue, moistened with a small amount of alcohol from the perfume bottle, wipe the glass surfaces to remove any streaks of residual oil. The quality and resolution of your image depends mainly on the Numerical Aperture (NA) of used objective . To very briefly, the NA relates to the light gathering properties of the optical components of your microscope. Using an immersion lens and oil can improve both your resolution and NA. The exact physical property of the medium/material through which light passes determines the amount of diffraction of the light. This is known as the ‘Refractive Index’ and is without units, as is NA. With non-immersion (or ‘dry’ as they are called) objectives, there is an air gap between the front lens of the objective and the top surface of the coverslip. Most microscope coverslips will have refractive indexes of 1.5, whereas air has a refractive index of 1.0. And as you know, when light passes from one medium to another, say from glass to air, it ‘refracts’ or bends and scatters. Therefore, if you use a dry objective the light rays from your specimen will undergo refraction when travelling from the glass coverslip into the air. Refracted rays are not usually collected by the objective front lens and are lost to the final image. Now if you use an immersion oil to replace the air gap you can correct this mis-match. Immersion oils have refractive indexes of around 1.51 – similar to glass. This improves the quality and resolution of your high-power immersion objective and increases your NA by lowering refraction. When you focus an objective and move it closer to the slide/coverslip the focal plane moves further into your specimen. However, there is a physical limitation to how far you can go before the nose tip of the objective hits the coverslip. Go any further than this distance and you have a big problem! Cleaning glass shards out of a condenser is a time consuming and expensive business. Not to mention you can damage the objective front lens. When a specimen is in sharp focus, the actual distance (in millimetres or microns) between the front lens of an objective and the surface of the coverslip is known as the ‘Working Distance’. In general there is an inverse relationship between magnification and working distance. An objective with 10X magnification has an approximate working distance of 4 mm, whereas a 100X oil immersion objective has a working distance of approximately 130 µm.